Diamonds have been mined in India since time immemorial:in fact, it is one of the earliest places in the world to have mines. 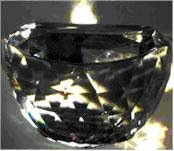 Golconda near Hyderabad has long been famous for its diamonds particularly the Koh-i-Noor, a humongous oval cut gem which is now found in the Monarch's State Crown kept with the Crown Jewels in the Tower of London. The Orloff which was a whopping 300 carats when it was originally found also came from India and somehow found its way to the imperial crown of Russia via Amsterdam! 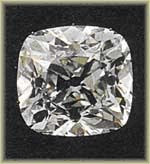 Another famous Indian diamond is the Regent which found its way to the Crown of France. Once again this was discovered by a slave in the Golconda mines who took it out of the mine by hiding it in the bandages of a self inflicted wound on his leg! Hoping to buy his way to freedom, the slave sold it to a seafaring captain. Unfortunately greed got the better of the captain who ultimately killed the slave and sold the gemstone to a diamond dealer. Eventually this stone was sold to Governor Pitt in Madras who sent it off to London to be cut into smaller stones. One of these stones was sold to Phillip II Duke of Orleans, then known as Regent of France ( hence the name). Today this diamond can be seen at the Louvre. 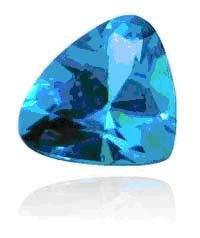 There are several superstitions associated with diamonds and jewelers sometimes advise a prospective client to keep the stone under his/her pillow for a week to see the effects of the stone. But there is no denying that diamonds are a girl's best friend. hi! our blogger town team found ur blog to be very interesting and unique! visit www.bloggerchat.in and publish your writings under any of the categories specified there. It could be a poem, story, random thoughts, or anything in the world! Make sure u specify your email-id through which we can let u know the results. The best few posts will be published on the site! And u would get to become one of the cool authors of BLOGGER TOWN (www.bloggerchat.in ) and what more? u can join the proud clan of crazy authors and bloggers of blogger town and even win e-books or t shirts! So hurry now and send in your writings! The evolution of the Arranged Indian Marriage.